Use Your Energy Well | Mediterra - Swim & Run Better Than Ever! Use the power you’ve got better. They don’t need to be mutually exclusive in training, but which one makes sense as your first objective as an athlete? The wise goal – no matter what level of achievement we seek – is to use the energy we’ve got well before we try to get more of it. When we use energy well we feel awesome. When we use energy poorly we feel like crap, and eventually we’re injured. When we use energy well, we go faster, we go farther, we enjoy the experience so much more. The human body responds marvelously to well-directed energy flow. Train the nervous system to harness and direct all the available energy, wasting as little as possible. This is what the human brain favors, and it will send pleasant signals that let the athlete know she is on the right track, and send unpleasant signals when she is not. Train the nervous system and the muscle system will get so much more work done for less expense. 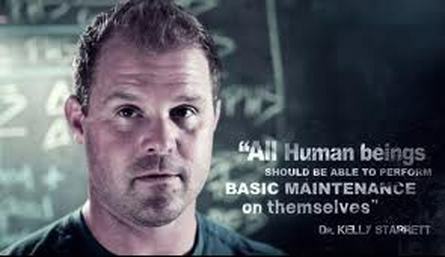 In this engaging interview of Dr Kelly Starrett of MobilityWOD (one of my physio-therapy heroes) by Timothy Ferriss (of Four Hour Workweek/Body/Chef best-selling book fame, and a self-taught TI student as described in his Four Hour Body book) Kelly explains how their approach is to teach highest performance athletes to rely on their nervous system rather than the muscle system as the primary high performance system – it is the ability to channel power effectively (with little waste and no risk of injury) that wins. The idea is not to cover up or compensate for problems with muscle strength, but to remove those problems with corrected position, improve mobility into the full range of expression, and improve motor control (= precision of movement). In other words, rather than start with building a bigger engine, learn first how to better engage the system you’ve got, to eliminate positional faults, remove movement patterns that ‘leak power’ (= energy waste) and lower the risk of injury under highest intensity action. There are some great stuff to ponder in this interview. It’s a long interview at 77 minutes (as many of Tim’s shows are) but it is good. I often make the time to listen to while I am doing my own maintenance routine in the mornings on my yoga mat.